Everyone wants to go wireless these days, and I cannot blame them for it. After all, living the wireless lifestyle is definitely something worth looking into, as we own more and more consumer electronics devices than ever before. Just take a look at the number of chargers that you need to pack before you head off on a long trip – surely the number might even scare you! Of course, audio visual devices too rely on cables, but these days, thanks to the wonders of Bluetooth as well as other wireless standards, you can live the untethered lifestyle. We will take a look at the Libratone Lounge and Libratone Live, where both of them will take advantage of AirPlay wireless connectivity. Just what is AirPlay? Here is a little quick primer for the uninitiated – AirPlay enables one to stream music throughout your entire pad sans wires. With AirPlay technology, it depends on the hardware manufacturers as to whether they want to integrate it into a range of devices such as speaker docks, AV receivers, and stereo systems. So far, companies such as Bowers & Wilkins and Denon have already jumped aboard the bandwagon, and Libratone decides to tag along, too. With AirPlay, you can stream songs from your iTunes music libraries on Mac or PC, in addition to the number of tunes that are stashed away on your iOS-powered device such as the iPad, iPhone or iPod touch, over one’s Wi-Fi networks. The Libratone Live and Libratone Lounge will boast of minimalistic interior, being rather diminutive in size so that it does not take centerpiece place in your home. 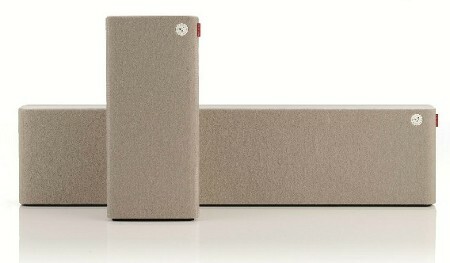 The Libratone Live is small and even comes with a handle for easy placement, while the Libratone Lounge was specially designed to be a stand alone device, and alternatively, you are able to fit it under a TV or just about anywhere aesthetically while enjoying a similar exceptional sound. The inclusion of FullRoom technology will make sure that acoustic sound is covered from corner-to-corner, and you are able to take this experience to the next level by personalizing the FullRoom feature with the Libratone App. Both devices are constructed from quality raw materials and are lovingly made, boasting craftsmanship that includes hand-picked materials such as cashmere, chrome and wood.